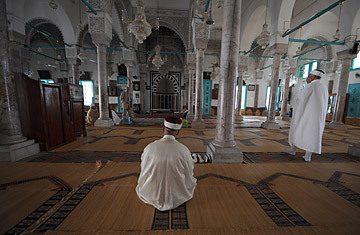 Tunisian Muslims offer prayers in a Mosque at Masra City in the North of Tunis. Tunisia's New Regime: A Lot like the Old Regime? Seif al-Aam, with his rimless glasses, navy pinstripe suit, black tie and woolen knee-length coat, looks more like a banker than a self-avowed Islamist as he walks out of the Al-Quds Mosque after Friday prayers in the LaFayette Belvedere neighborhood of Tunis. Tunisia's Islamists, long pummeled into submission or exile by deposed dictator Zine El Abidine Ben Ali, are not the stereotypical long-bearded, dishdasha-wearers seen across the Middle East. But he is a true believer. "I am an Islamist, I was born one and I remain one, but I am not a terrorist," Aam says, outside the front steps of the mosque as a group of men crowd in around him and jostle to have their say. Aam, a construction engineer, was imprisoned from 1995 to 2001 for being a member of Ennahdha, the Islamist party banned by Ben Ali in 1992 for allegedly trying to establish a Muslim fundamentalist state in strictly secular Tunis. Today, Aam says, was the first time that he prayed at his local mosque freely, without fear of the omnipresent plain-clothes policemen who were the eyes and ears of the despotic regime. As Tunisians revel in their newfound freedom, the long-suppressed Islamists, like everyone else, are trying to figure out what role they can and want to have in the new Tunisia. Ennahdha leaders  including the party's exiled founder Rachid Ghannouchi, who is waiting to return from London  have been quick to reject fears that they espouse, let alone want to impose, a radical Islamic view. During a 30-minute sermon, the imam of Al-Quds mosque urged worshippers to take advantage of "this current change" and vote. He didn't suggest who they should vote for, but cautioned that this opportunity should not be squandered. "Our future is in our hands," he said. "The [Arab] regimes don't want us to succeed, they want us to fail so they can tell their people 'look at how Tunis has failed.' We must accept each other and unite, because there is strength in unity. This is our country." Many of the hundreds of men streaming out of Al-Quds Mosque on Friday, some clean-shaven in sharp business suits, others with chin-length beards and no moustaches, were all eager to stress national unity and warn against attempts to sow division. "Tunisia needs all of its children, even some of those in the RCD," says Rida, 32, using the initials of the ruling Constitutional Democratic Rally. "We don't have extremism, people like to frighten others with labels," says Shawki, 34. Still, he follows up with a view that might give pause to some Tunisians. "God has given us our constitution, the Koran. Give me the Koran and the Sunna [sayings of the Prophet]," he says. The worshippers claim that in a bid to stifle the influence of the mosques, Ben Ali restricted their operating hours to 30 minutes a day, five times a day during prayer times. Abdel Kouki, 57, says he wants the "liberation of the mosques." Former U.S President George W. Bush was responsible for sowing fear of Islam, he says, a view Ben Ali enthusiastically propagated to clamp down on opponents. "We are not backward terrorists," Kouki says. "Muslims don't have to have blue eyes to be modern." The interim government has announced a general amnesty for political prisoners that would also allow the return of political exiles. Aam, the construction engineer, says Islamists must also forgive those who persecuted them. "I was tortured and imprisoned, but I'm telling you there are a lot of good people in the police force," he says, referring to a security apparatus that was considered an arm of the regime. "The RCD has bad elements, but also good ones. The people who committed crimes should be tried, but there are good people also. We mustn't forget that."